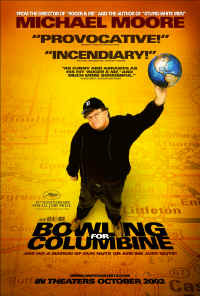 If you haven�t already, please watch the excellent �Bowling for Columbine� video by Michael Moore. He did a great job confronting people with issues no one else has before � at least not in public. Hats off! Questions of great importance and significance were asked and directed to persons that he interviewed in the movie, but those questions were also indirectly meant for us; things we need to think about, like:1. How come those two teenagers suddenly go berserk and kill people in a totally insane action? 1. How come those two teenagers suddenly go berserk and kill people in a totally insane action? 2. Why is the annual murder statistics significantly higher in the US compared to other countries? Moore did some research on this and found out that it does not have anything to do with that the US citizens are allowed to own guns. In Canada there are approximately 7 million legal weapons and guns in circulation among the population, and there are almost no murders. He confronted actor and gun-promoter Charlton Heston with this question and was literally told to leave by an annoyed actor. 3. Is the higher murder rate in the US due to the violent past of the American history? This is what Mr. Heston suggested, but that does not hold water either, because Great Britain and Germany, for example, have more violent pasts than the U.S., and still the statistics are lower in Europe. Michael Moore also pointed this out to Heston. 4. Why is media choosing to cover only the issues that have to do with fear and terror, death and war? Why do they want to spread terror into peoples� minds? 1. 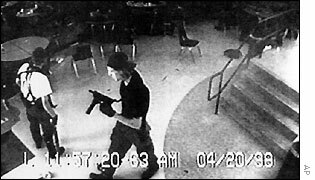 How come that both Columbine killers shot themselves after the shooting? If one of them was insane enough to do so it could make sense, but both? Is something else going on here? 2. Michael Moore mentioned this, but didn�t expand on it: how come, if the Government [Illuminati] wants to disarm the people to make us easier to control, and prevent us from making resistance in time for a take-over, that people purchased more weapons after 9/11 than they have ever done before? Couldn�t the Illuminati have predicted that this would happen?  Isn�t that a contradiction? Well, the Columbine shooting is of course not one of a kind; this has happened before and will unfortunately happen again. In an earlier chapter I have talked about the Illuminati formula, problem-reaction-solution: the Illuminati create a problem, which produces a reaction among the public, with a demand for the Government to do something about it, and the Illuminati present the solution to the problem they themselves created in the first place � all in line with the movement towards a totalitarian state where our freedoms are taken away, bit by bit and piece by piece. If we look at it, the only possible explanation for school shootings (and in a broader perspective even terrorist attacks and assassinations) is the above problem-reaction-solution sequence. The Illuminati want to disarm the population and take away are rights to carry weapons. The only way to do so is to make us afraid and terrified of weapons. They have to convince us that weapons are dangerous, and we can�t trust anyone who has a gun in his/her possession. With a lot of help from mass media (which they control) they first create a perfect Manchurian candidate(1) to execute some horrible murders in an unpredictable part of the country; the more remote, the better. This is because most people in rural areas believe they can be safer than people in the cities, because �we all know� that cities are more dangerous, with lots of criminals wanting to rob us and kill us while on some strange drugs. Therefore it is more likely to create a greater amount of terror if you let someone go berserk in an area where people normally feel safe. And interestingly enough, after a rural area killing the media are quick to interview people and have them explain to us how they all of a sudden have the feeling they can�t be safe anywhere; not even in remote areas. This is all a combined effort from the Illuminati Network to terrorize us and give up our rights. Further, it has showed in different reports and research that all of those insane killers had CIA or Intelligence connections, and most of them were on psychotropic drugs, like Prozac and others. Knowing the Illuminati and how they operate, and their ability to alter peoples� minds, it is easy to make the connection(2). The next question is why the murder rate in the US is so much higher, statistically, than in other parts of the world? I think that Michael Moore answered that question to some degree himself in the movie. After he noticed that the murder rate in Canada is extremely low although many people own guns in Canada, just like in the US, he also noticed that the TV programs the Canadians are watching are dissimilar to the programs the Americans watch. On Canadian TV the politicians are mostly talking about how they can increase the welfare for the citizens and how life can be improved(3). In America the News is mainly about terror, death, violence and insecurity. I know this concept to be true also in Europe from have lived there. The local news in Europe is mostly about politicians discussing local or domestic issues, and how to improve things. Therefore, when international issues are brought up, people in European countries often feel like the information comes �from another planet�. This does not mean that the politicians in other countries are more honest than the American politicians per se, but it is a fact that the news are presented differently. And, naturally, the news in other countries like Canada and the European countries, also bring up what is happening in the US, but the interesting thing is that I remember how I used to think when living in Europe: �My goodness, the US is a very dangerous place to live in, look how violent it is there!� However, it did not frighten me, because I was living far away from it, and I remember thinking: �... at least it is not like that where I live�. I suppose people in different countries have similar thoughts, and they distance themselves from what is happening here in the US because it is far away. On the other hand, people living in America are in the middle of the real (and invented) terror and terror threats. Because the Illuminati have decided to start disarming people here in the US, the media are concentrating on making the American people feel insecure. And they are succeeding. Knowing that the American people want to hold on to their right to own weapons, they have to inflict on peoples� freedom little by little; one baby-step at the time, until we are willing to give up our weapons to feel more safe. So this has nothing to do with the violent history of America, it is set up and planned this way. You can see news reporters interviewing people on the street, and the people they choose to show on Television tell us they are willing to give up some of their freedoms if the government protects us. This sets the direction for the future in peoples� minds. Now, let us go back to the Columbine shooting and other school shootings as well. How come that so many killers end their horrible act by killing themselves? Have you asked yourself this question? To commit suicide is not a natural thing to do. How convenient for the Illuminati to let the Manchurian candidate kill himself, so he can�t be heard in a court of law. It is not a secret or a conspiracy theory that the CIA and the secret government are capable of creating mind controlled slaves and program them to do whatever they want them to do, and trigger them remotely. It is all on record in the Freedom of Information Act. Read the MK-ULTRA files, the proof is there for everyone to read. Although the government assures us that this is not happening today, we would be fools to think that it is not. It definitely happens, and today the techniques are even more sophisticated; I have personally met, talked to, lived with, and I am still in contact with people who have been severely abused by the CIA and other branches of the Illuminati. The fact that both Columbine killers took their lives is a certain indicator that they were mind controlled into executing a program that was implanted in them, either through trauma-based mind control, implanted micro-chips, or most likely both(4). After 9/11, according to Michael Moore, people armed themselves more than ever to protect their families and friends. How does that fit with disarmament? It fits perfectly. The main thing is to create fear and terror in the society, and although people are arming themselves, the Disarmament Project will eventually succeed anyway, unless we all wake up, which is something the Illuminati don�t think we will ever do. By creating terror, people become more insecure, and more shootings will take place in the future, some of them manufactured by the government, while others are just desperate killings by people who feel threatened by real threats or imagined. It will come to a point when the population finally will give in and give up the right to weapons. And with a pen-stroke the President will create a new law, which violates the 2nd Amendment. The basic reason for the citizens to have the right to own guns is to protect themselves against an insane government. We all wish we didn�t have to do that, but analytically we know we do. This does not mean we should go out and kill our government, but we have the right to defend ourselves toward slavery and dictatorship. In Summary, the amount of guns owned by the population of a society is not the reason for increased violence by comparing Canada and other countries. But we have seen if we have had our eyes open, that the reason for increased violence is how media present the news, and how the Illuminati create terror and fear. (3) Whether the Government does increase the welfare or not is beside the point for this particular discussion. The only point we try to make is that it depends on, to a great degree, what is discussed in the media, when it comes to how the society will react on different issues. Authorities Had 15 Contacts With Columbine Killers!